In the strange and hostile world that was once their home, the two astronauts have found one true friend...Galen. We should be there in a few minutes now. Look Galen, are you sure we won't meet up with another of those friendly reception committees that seem to be waiting for us wherever we go? This is one place where we WILL be safe. I don't blame you for being bitter, but don't judge all apes by the actions of the Urkos among us. Look, there it is. I like to think this village points the way to the world of tomorrow. A place where artist and artisan, thinker and worker, apes and humans, all live and work side by side in harmony with each other and nature. You'll see what I mean when you meet Landa. An artist of rare sensitivity. Her work is filled with love and compassion for all living things. She is also prefect of the village. I thought that would surprise you, hmm? Well, here we are. But where is everybody? Hmm. That is strange. I noticed that no one was working in the field, but I thought perhaps it was lunch time. Here. I'll knock on this door. Let's look around some more. If you ask me, I'd say this place is deserted. Look at this house. Door open, dinner plates on the table. Food still on the plates. Whoever lived here left in one big hurry. Sure looks like trouble in your "paradise", Galen. I don't understand it. But Landa will explain. Let's get over to her house. It's just down the way. No answer. Try the door. Landa? It's me, Galen. She's not here. Oh my. Now I AM worried. Look at those paintings! Pete, Galen wasn't exaggerating. She IS good. Yeah. The color. The composition! Who would ever dream an ape could create work of this caliber? Something terrible must have happened. Landa would never leave her house like this. It came from up in that loft or attic. Whatever they call it. Come on! Up the ladder. Landa! Landa! It's me, Galen! Ohhh. Where am I? Galen! Oh Galen, I'm so glad you're here. Yes. I think so. Who are they? It was terrible! They came out of the sky. Out of the sky? What do you mean? A huge airship landed in the field at the end of the village. An airship?! Can you describe it? Here. I'll make a rough sketch. It was round, like a dish. About 30 feet in diameter, and about 10 feet high. Looks like one of those experimental space craft we were fooling around with in the late '70's. A large door in the side of the ship swung open and down. Like this. Reaching the ground. Like our naval landing craft in the old days! And two huge armored vehicles rolled down, followed by some humans on foot. Carrying guns. Their leader was very efficient. Spread out! Don't let any one of those animals escape! They killed all those working in the field. No wonder we didn't see anyone there on our way in. I formed a committee representing those of us still alive in the village. And tried to negotiate an end to the killing. Negotiate? You have nothing to negotiate with. But we are just a peaceful community, and no possible threat to you! You and your village are of no consequence to us whatsoever. Some here are humans, just like yourself! Obviously an inferior breed; quite as expendable as the gorillas, chimpanzees and orangutans that make up the so-called "rulers" of this planet. You know about our political structure! One week in orbit on reconnaissance was enough for us to take possession. Take possession? With only 30 men? With our superior armament, mobility and intelligence, 30 men is enough. We shall eliminate as many of you as is necessary to convince your rulers that resistance is futile. Then we shall repopulate the planet with a superior race! Utilizing those of you who survive as a work force. And now, enough of this talk. Round them up! Take them to the pit on the other side of the village and dispose of them! No exceptions! Horrible! Horrible! But how did you escape? Somehow, in all the confusion, I slipped away into the woods. When I was sure they'd gone, I came back here, where you found me. And they refer to US as animals! Yeah. We had a bellyful of that "superior race" garbage in the World War II period of the 1900's. I tell you Galen, if Trang and his men are not stopped, we are all doomed! Back in Central City, an emergency meeting of the leaders of the country is in session. Dr. Zauis is speaking. The day we have long feared is upon us. 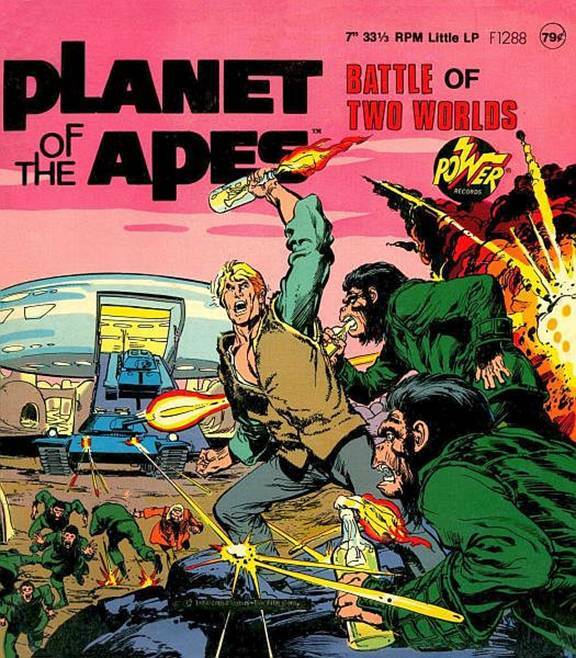 A small but extremely dangerous band of killer humans have invaded our planet. Speak for yourself, Dr. Zauis! You and your intellectual friends may fear these invaders but I fear no one! Nobody questioned your courage, General Urko. But the situation is critical and calls for careful study and planning. There is no time for that! Just give the word and my army will move to the attack within the hour. And the invader would mow your gorillas down like grass. You wouldn't have a chance against their advanced armament. What alternative do YOU propose? As for me, I'd rather go down fighting than sitting here waiting for them to come and get us! In the old armory outside of the city, we do have some 20th Century weapons similar to those used by the invaders. After so many centuries of disuse I frankly doubt it. But it is worth looking into. You can waste time puttering around with your old antiques if you like. But I say your fears are exaggerated. And I'm giving battle orders right now. Sergeant, get the troops ready to ride! We'll search out the enemy wherever he is and destroy him! Meanwhile Pete, Alan and Galen hold their own council of war, together with their friend Landa, in the field at the end of the village. Here's where the ship landed. Look at that, Pete! Those tracks. Yeah. Probably running on high-powered batteries or nuclear fuel. Though gasoline fuel is conceivable. And how do you stop tanks with rifles? Like shooting at an elephant with a pea shooter! Greedy men used to hunt them down for the ivory of their tusks. Until wiser and more compassionate laws put an end to the practice. Are you going to stand there and preach morality all day? Justice vs. injustice. Right against wrong. Love against hate. Isn't that what morality is all about? The conflict between good and evil is always a moral struggle. An unending battle of two worlds. And now I wonder: which side are YOU on? OK, OK. Cool it. I'm with you. General Urko's gorillas! We must hide! Quickly! Over here behind the bushes. There they are, five of them. Look at this, Sergeant. What'd ya make of those marks? The invaders! Their airship must of landed here. Quick, Blendo! Ride back and report this location to headquarters at once. But what made these tracks, Sergeant? Some kind of vehicle that travels on land. Maybe the kind I once saw when I was on guard duty at the old armory. They lead that way. The old armory...hmm. Landa, do you know where it is? About 10 miles from here down that road. We've got to get there. And we sure can use these horses the gorillas have. Can you ride? Yes. I'm quite expert at it. I'm not an expert but I think I can manage to stay on. Good. Only one gorilla guarding them. Alan, let's take him! That takes care of him. And the others haven't seen us yet. Mount up and let's go. There it is. The old armory. Yeah. Two guards in front. Any other entrances, Landa? No, except for a window in back. Rather high up. You and Galen wait here with the horses. Come on, Alan. Let's see if we can get in. There's the window. Hey, looks easy! Give me a hand up. Uh! Now you. Whew! Yeah. Hey, look there! Big guns. Jeeps. Armored cars. And over there. Do you believe THAT? Fighter bomber! World War II. Pete, look! Yeah. Let's take a good look. Oh, forget it. Can't stop Trang with that. It's so rusty it'll never run. Then none of this other stuff will either. Even if there were enough gasoline. Gasoline! This big metal drum...it's marked "gasoline"! Is it possible it didn't deteriorate or evaporate over the centuries? Hey, baby! No mistaking that smell! So what good is gas for machines that can't run? What good is it? Cocktails, my friend. Delicious cocktails! You catch on quick, buddy. There's some bottles up on that shelf. And look: kerosene lamps. We can sure use those wicks. Racing against time, the two astronauts assemble their fire bombs, stuff their pockets with grenades they found in a box and slip back to Galen and Landa just as a large detachment of soldiers pulls up at the front entrance. The gorilla Blendo must have met them on the road and told them about Trang. Uh oh. Speaking about the Devil. Listen! Colonel Trang! Coming from the other direction. And no mistaking the sound of tanks. Look! Urko heard them, too. It's the battle of two worlds, alright. And here we are, right smack dab in the middle. Quick. Landa, Galen. Get the horses behind the trees and stay down. Come on, Pete. These bushes give perfect cover. Here they come! Light up! I'll take the first one, you take # 2. Now! The fire bombs stop the tanks in their tracks. And as the men inside try to get out of their disabled monsters, they are met by a shower of hand grenades tossed by the two astronauts before the eyes of the astonished gorillas approaching on horseback. Come on, Pete. Let's get back to the horses. GALEN: Pete! Alan! Over here! Wait a minute-- she's breathing. The bullet just creased her head. She's coming around. I think she'll be all right. Who did it? It was Trang himself. He took one of the horses and went that way. Alan, we've got to stop him. He's headed back for the spaceship, and that ship is our ticket back home! Galloping furiously down a path through the woods, they suddenly come to a clearing. There it is! And it's a spaceship alright. A beauty! Listen...the motor's running. Look out, he sees us! He's going to get away! Not if I can help it. The door is still open. And I've got one grenade left. Racing his horse directly toward the spaceship, with Alan close behind him, Pete hurls the grenade through the door, a split second before it closes and the ship starts to rise. Our luck. The last grenade and it's a dud. What's that? The grenade! It went off. Look, the door's opening. Someone's going to jump! It's Trang. Good lord! The ship blew up! Completely disintegrated! There goes our ticket to home. Trang got out just in time. But I don't think it did him much good. Let's get over there! BURKE: He looks all busted up. Uhhh...filthy animals! Wipe them out! Destroy them! Trang, listen. We are astronauts like you. How did you get here? Do you have any other base on the planet? We won't get anything out of him. Fanatical to the end. History sure has a way of repeating itself. Uh oh! The gorillas! We're sunk! They've got Galen and Landa with them. OK, OK. We give up. Hey! The gorillas... They're leaving! Pete, Alan. You're all right? Yeah. But what gives? How come they're letting us go? Urko still considers you dangerous, but because of what happened today, Dr. Zauis convinced him to let us go. This time. A sort of temporary truce? Better than no truce, wouldn't you say? Hmm? You see, justice and mercy still live. 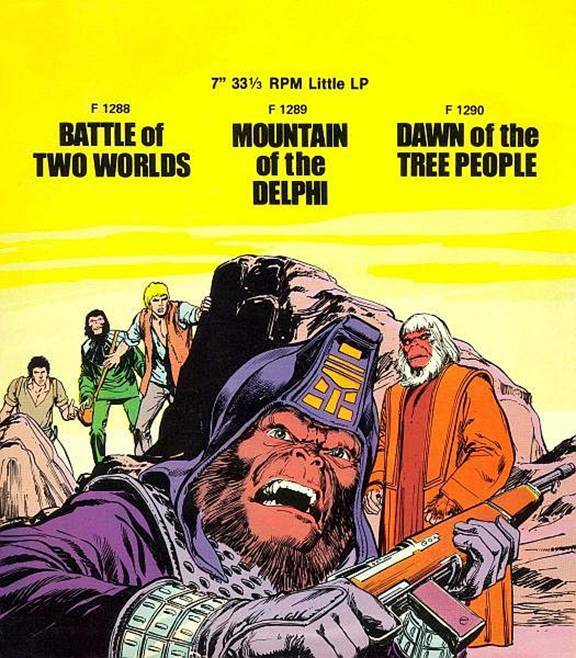 Even among the apes. What will you do now? Get as far away from Urko as we can! How about you? I shall go back to my village. It's a dream that's worth rebuilding. Landa. Painter of beautiful dreams. We'll never forget you. Galen? Coming? In a minute. I have a little dream-building of my own to discuss. With Landa. Uh, OK. We'll wait for ya. Down the road a way.